The upper body is the robotic arm which, in turn, actually consists of three main parts. One is the base of the arm that connects it to the under body and supports all the weight of the arm and any objects that come into its grasp. 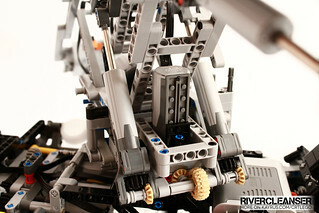 The second is the arm itself which is supported by some liftarms attached to the base. 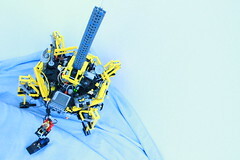 At the end of this arm, there is a manipulator which is essentially just a functioning claw. The fourth and last part is the counterweight that reaches back in the opposite direction of the arm. Let's begin with the first piece: the base. In the base, there are two motors –one M and one XL. The M motor is responsible for turning the entire upper body –this requires a substantial amount of torque and a geartrain that can handle that torque. Since an M motor was used to provide this torque, it had to be geared down to a suitable speed, one that would produce enough torque and allow the arm to rotate at a maneuverable rate. The structure of the arm's base provided very little space for any gearing at all, but after countless rebuilds, a setup was finally found that, although not particularly fast or powerful, finally allowed the M motor to transfer its rotational motion to the turntable on which the upper arm sat without any teeth slipping. While the M motor is mounted vertically, the XL motor is attached horizontally behind the M motor's geartrain. It drives two linear actuators on either side of the M motor via some gearing below the M motor. These linear actuators lift and lower the liftarms that hold the rest of the arm above the base. 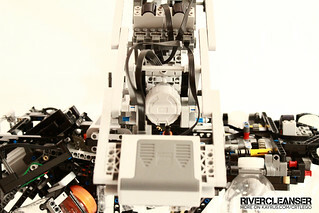 The arm is connected to the base with some liftarms in such a way that it always remains parallel to the base and the rest of the robot. The angle that these liftarms are mounted at not only moves the arm up and down but also back and forth when they are moved by the linear actuators. This gives the arm more reach. The arm itself consists of two segments. 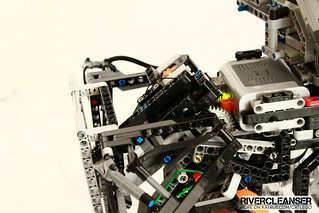 The first part houses two motors while the second part is a slim and long connection to the claw. This segment is connected to the motor housing at one end at an adjustable angle and by pins to the claw at the other end. Since the claw is expected to be submerged or close to water, it is controlled from abroad by the two motors that were mentioned previously. Another reason for keeping the motors far from the claw and towards the rear of the arm is to shift the weight of the arm back to the center. If they were kept on or near the claw, the stress on the arm and the linear actuators would be significantly higher. 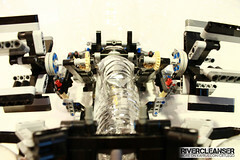 Since the second segment connects the motor housing to the claw at an angle, four universal joints were used –two for each motor. To give the claw some wiggle room it is left suspended from the arm by two pins set on the same axis –this axis is its pivot point and the claw is free to swing about it. There are, however, pieces that were put to prevent the claw from swinging outside the turning range of the universal joint within it –this prevents the universal joint from locking simply by swinging. 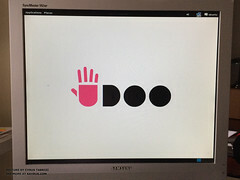 The claw itself is rather simple. It is built off of a large turntable, one that is driven by the input of an 8t gear. Through the center of the turntable runs the second input, one that leads to a worm gear in the center of the claw. This worm gear drives two 24t gears on either side of it, each connected to a side of the claw. 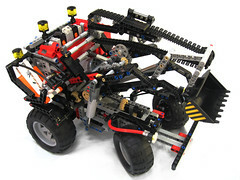 The clawing action is driven by an XL motor (this was originally an M motor, but was replaced by an XL when the M motor's cabling stopped working) while the rotation is powered by an M motor. The claw performs rather well but has trouble grabbing onto some objects. Several versions were built; some included shocks for flexibility while others had rubber tires or treads to provide grip. 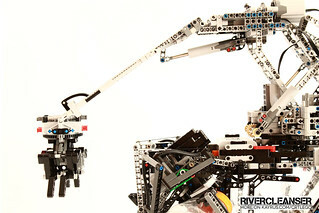 Because of the arm's modular characteristics, it is extremely simple to swap the claw out for another one; simply pull out four pins and switch. The last part of the upper body is the counterweight. Its weight is mostly derived from the six AA batteries inside the battery box, but it is also the long distance from the center of the arm that contributes to the weight's effectiveness. 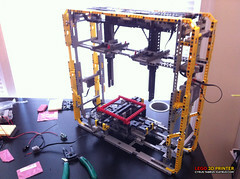 The battery box is attached to both the upper arm and the base by liftarms and the geometry of this connection keeps the weight in a position that counteracts the movement of the rest of the arm. Also acting as counterweights, albeit barely, are the two receivers that sit in a position between the arm and the battery box. 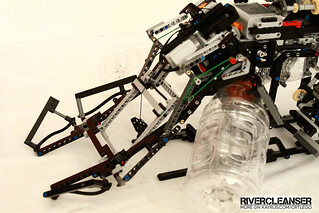 The rest of the body consists of an undercarriage, eight plastic bottles, two paddlewheels, a motorized lift tray, and a working winch. The undercarriage itself faces two challenges: how to brace and position the bottles in a suitable position and how to support the weight of the entire upper arm on top of the forces presented by the eight bottles. 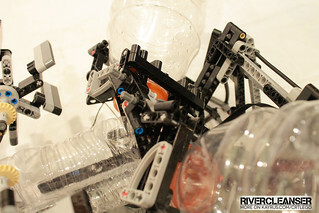 The bottles are of critical importance to this robot –they are its main and only means of floatation. 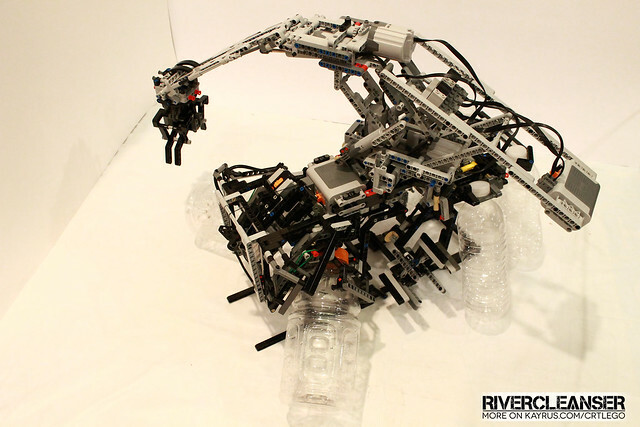 There are three large (32 oz each) and five medium bottles (roughly 20 oz each) mounted below the robot, most of which are at near–vertical positions. 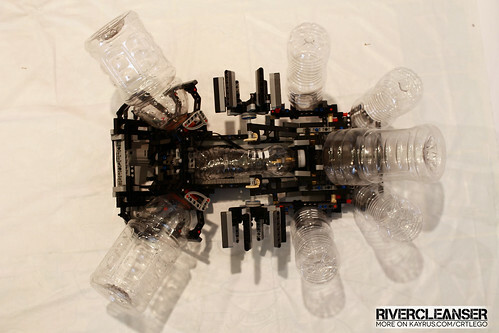 Most of the robot's weight can probably (highly likely –not tested) float on the three large bottles. 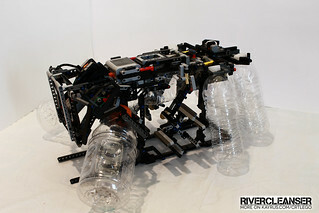 The reason for this is that the robot doesn't have a problem with buoyancy (three bottles or less are enough to float it), but rather the problem is the distribution of this water displacement. 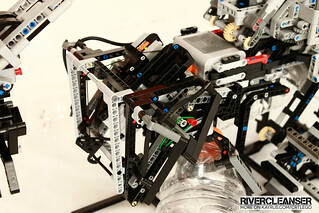 For the robot to float, balance, and remain stable, the water displacement must be spread in a particular manner. 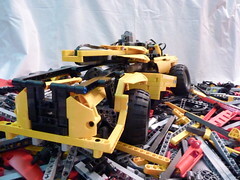 Not only must there be a large contact surface, but the outer edges of this surface must be far enough away from the robot to keep it from tipping over or flipping. One might decide that making a raft whose bottom is completely flat to distribute weight evenly would be the best idea, but if the center of gravity is high enough, the raft will surely flip over –this is because the entire raft becomes the floating pivot for which it will flip on itself. This robot has most of its bottles standing around the perimeter at angle that makes them lean into the robot. On the individual bottle scale, this would encourage it to tip over in the direction it was leaning and make it harder to fall over in the opposite direction. On the scale of the entire robot however, these bottles are all leaning in against each other, keeping it stable and making tipping in any particular direction much harder than it would be if the bottles were completely vertical. In fact, mounting the bottles at a near–vertical angle (not too steep though) makes it easier to brace than if they were in any other position. One bottle, however, is left mounted completely horizontal in the center simply to divert any splashing water from hitting the battery box, wires, and the motors in the front and rear. 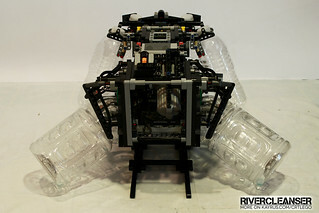 The rest of the undercarriage is just as complex as the bottles it rests on. In the rear (where there are five bottles), there are two M motors and a receiver. These are for the robot's propulsion. 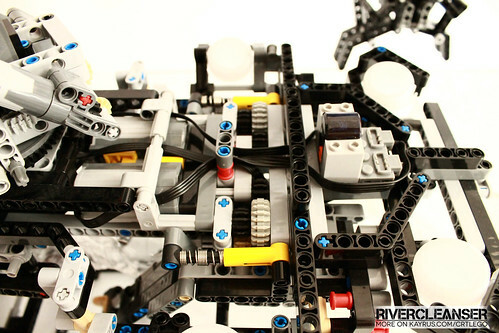 To move the robot, there are two paddle wheels on either side of the chassis that hang low enough to interact with the water. 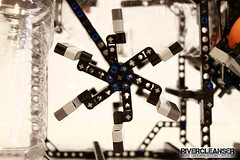 Each paddle wheel is connected to the body via an arm that comes down from the motor housing. This keeps the wheels away from the motors and the motors away from the water. Universal joints are used to transmit each motor's motion through the arm to some bevel gears near the wheels. These gears change the angle of motion to the horizontal axis that the wheels rotate on. 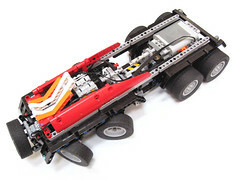 To give the wheels some flexibility, shock absorbers were connected to the arms, allowing the wheels to bounce upwards towards the body if they run over obstacles in the water. While this helps with fixed obstructions like underwater rocks and logs, no countermeasure is installed to deal with floating plantation getting tangled within the paddle wheels –these make the wheels heavy and less aerodynamic, hindering their performance in the water. The front of the undercarriage has an extremely compact design. 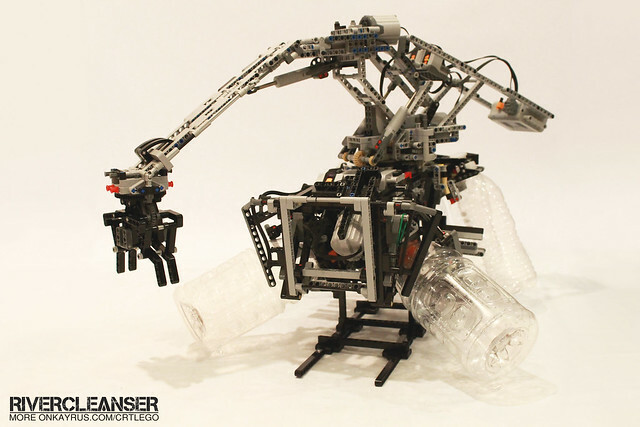 It sits on two bottles whose mounting required pushing the Lego pieces to the limits of their geometry –they are braced so tightly it is a feat in itself but the angle the bottles are ultimately set at make it all the more interesting. 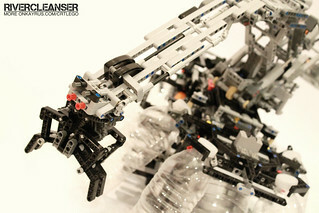 The housing is connected to the body at an angle and the liftarms connecting each bottle to the housing are attached at a second angle –this leans the large bottles in against each other and the weight of the robot. This is done while leaving room in the center and above it for the lift and motorized winch. The winch actually rests in the 5 stud space in the housing between the two bottles. 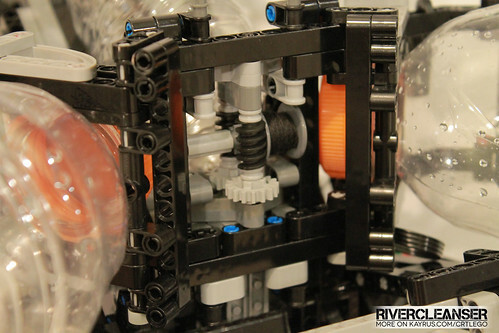 The M motor that powers the double worm gear drive lies at an angle pointing downwards towards the water. ''What good is a winch on a floating robot?'' one might ask. 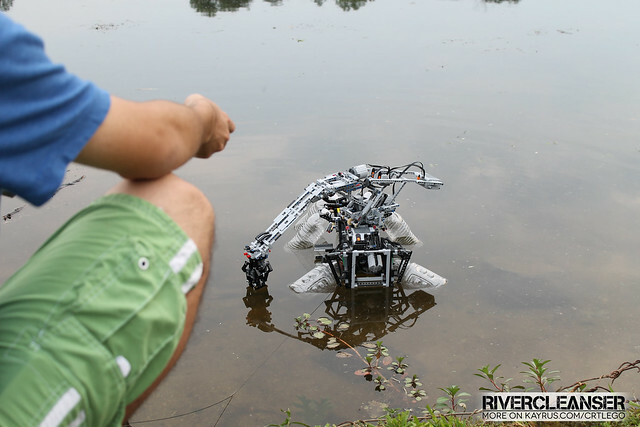 Simply put, the parts cost of this robot is not worth the possibility of letting it run loose on a lake without any physical means of repossessing it; should the batteries die or the receiver not work, the cable can be pulled on to bring it back to shore. This precaution assumes that before deployment you run the winch a little to obtain enough string to ground it and that you then run the winch whenever the robot goes farther away. Right next to the winch's motor, there is a large XL motor whose unwieldy torque caused issues until a suitable mount was made for it to run the robot's lifting tray. The tray itself works so smoothly it's practically origami. It has two sections that fold together to create a bowl in which it can collect trash. When it is folded, it folds over the XL motor and does so at a right angle. When it unfolds, it can lower to just above the water in a bowl shape or it can continue, unfolding completely and dumping its contents into the water. The folding action is one that is hard to motorize –it requires a combination of torque and distance that will give the liftarms the leverage they need to fold back in and the degree of motion that allows it to extend completely. 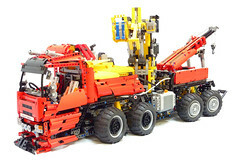 To do this, the XL motor was geared down with a worm gear and a 40t gear –a difficult combination to implement sturdily and in a confined space. 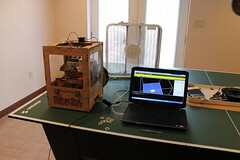 Ultimately, it runs, but only with the help of a couple of strategically placed rubber bands. The tray itself works beautifully and holds large objects in place long enough to dump them at shore –small objects, don't work so well. All in all, the RiverCleanser is a job well done. Considering it was built in two weekend's time, its only the tip of the iceberg. 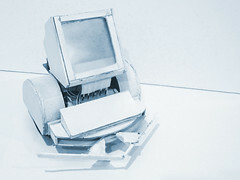 It serves as a stepping stone in the creation of future robots that will interact with the outside world, a world whose nature is constantly adapting, creating new problems on top of old ones, and sometimes, just sometimes, creating problems that cannot be solved by the human touch. For now though, we can all rest assure that our lakes will be cleaner by the hour as the RiverCleanser collects one bottle at a time. Below is a video of the RiverCleanser doing some tests indoors. 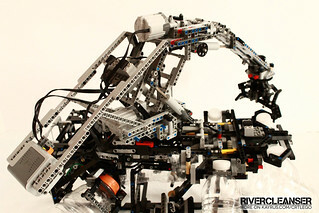 More pictures of the RiverCleanser can be found on Flickr. 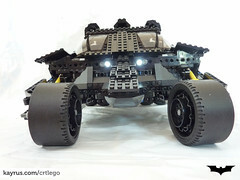 For further information or questions, contact the creator at crtlego@gmail.com.